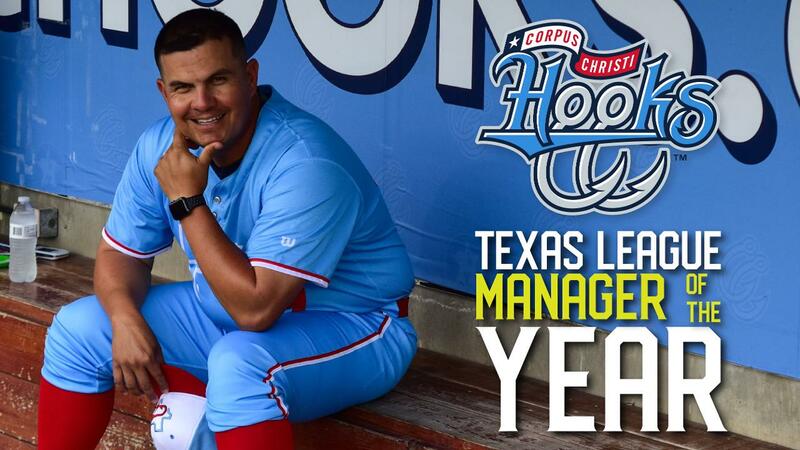 FRISCO - Hooks skipper Omar Lopez is the 2018 Texas League Manager of the Year. Lopez's hitting coach, Troy Snitker, has also been honored as the Mike Coolbaugh Texas League Coach of the Year. The announcements were made by TL President Tim Purpura. Lopez is the fourth Corpus Christi manager to earn this prestigious postseason award, joining Dave Clark (2006), Keith Bodie (2012), and Rodney Linares (2015). In his first season at the helm, Lopez has guided the Hooks to the best record among the 30 Double-A teams at 80-54 (.597). This mark currently ranks sixth in Minor League Baseball. The Hooks, who used a five-game win streak to capture the Texas League South first-half title, can claim the second-half pennant with a victory tonight in Frisco. Corpus Christi has run the table only once in its 13-year history. The 2013 squad went 83-57 to win both halves. Lopez, who is wrapping up his 20th campaign with the Astros organization, has won two Venezuelan Professional Baseball League championships in four years as manager of Caribes de Anzoategui. Caribes claimed the crown this winter, defeating Cardinales de Lara, 4-2, in the title series. In his first year as skipper, Lopez was named 2014-15 LVBP Manager of the Year after piloting Anzoategui to a 39-24 record and circuit title. Snitker, in his first season with the Hooks, is the third Corpus Christi coach to win Mike Coolbaugh Texas League Coach of the Year. Pitching coach Gary Ruby won the award in 2013 and hitting coach John Moses took home the honor in 2011. Hooks hitters rank among the TL leaders in RBIs (597, 1st), steals (177, 1st), batting average (.268, T-1st), hits (1,206, 2nd), doubles (242, 2nd), runs (640, 3rd), and triples (35, 3rd). Corpus Christi hurlers pace the circuit in ERA (3.41) and opponent batting average (.235) and have established a new Texas League record with 1,293 strikeouts. The Hooks have advanced 14 players to Triple-A Fresno this season. Southpaws Cionel Perez and Framber Valdez, who began the year in Corpus Christi, have gone on to pitch for the Houston Astros. Right-hander Josh James will be added to this list, as he is slated to make his big-league debut in a start Saturday night against the Angels.